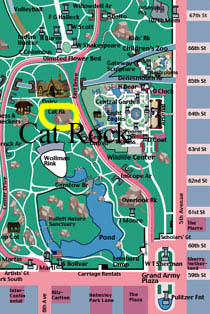 Cat Rock is located immediately north of the Wollman Skating Rink at the very south end of Central Park, just a short walk from Rat Rock. Follow paths east from Rat Rock, walking under or over Center Drive. Cat Rock is the obvious south-facing rock wall. 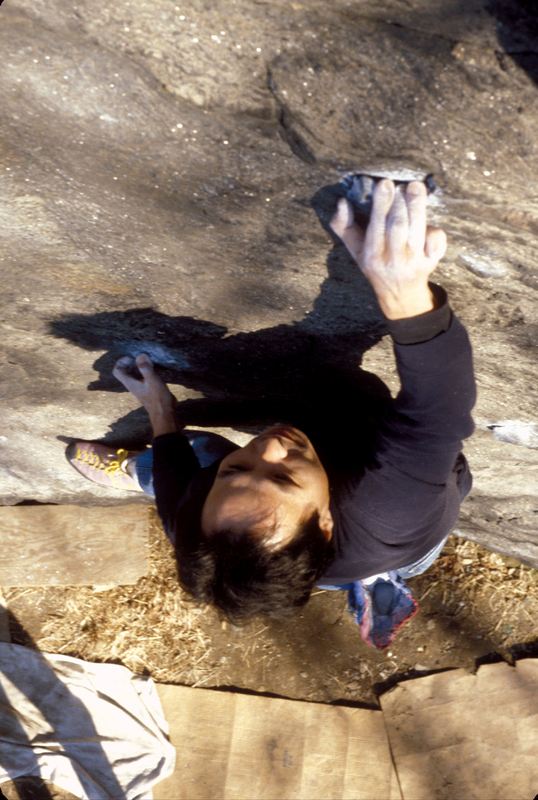 In the summer of 1987, when I first visited Cat Rock, there were only rumors of bouldering routes there. What I initially found was not encouraging. There wasn't a single trace of chalk. Beyond the obvious corner and the arete that created it, the wall was very steep and at first glance, utterly blank. Tall weeds and bushes grew close to the rock face and true to its name, feral cats lived under the boulder. A cat-loving homeless person made sure they were well fed by placing open cans of cat food along the base. Over the next two years, however, Cat Rock underwent an amazing transformation and emerged as a true proving ground for local and visiting climbers. The only two established problems in 1987 were the obvious arete and the steep face immediately to the left of the arete. These were to be eclipsed by long sought after routes up the middle face. These new routes were pioneered inwinter as cold dry weather proved crucial to sticking to the endless parade of tiny crimpers. Initial attempts at the blank middle face proved fruitless. It seemed impossible to many and rumors circulated of previous eras of strong climbers all failing to find a way up. Then, toward the end of 1988, Nick Falacci established Fancy Feast V3 on the very left side of the middle face. Jeff Dahlgren quickly repeated the problem and found it was possible to move right after a few moves and access small holds high on the middle face. Dahlgren's variation became a classic new problem in its own right (The Dawg V5), but more importantly revealed that the upper half of the middle face was climbable. Would the bottom half go? 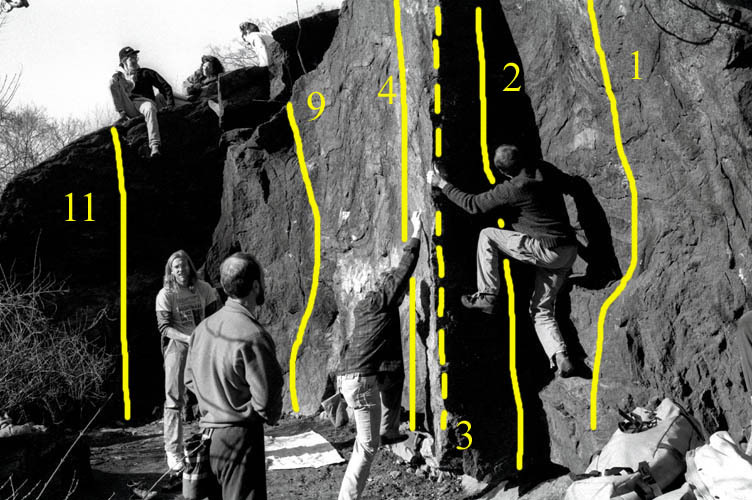 The answer came quickly in early 1989 when New Mexico climber Jean DeLataillade unlocked the sequence to the opening moves. 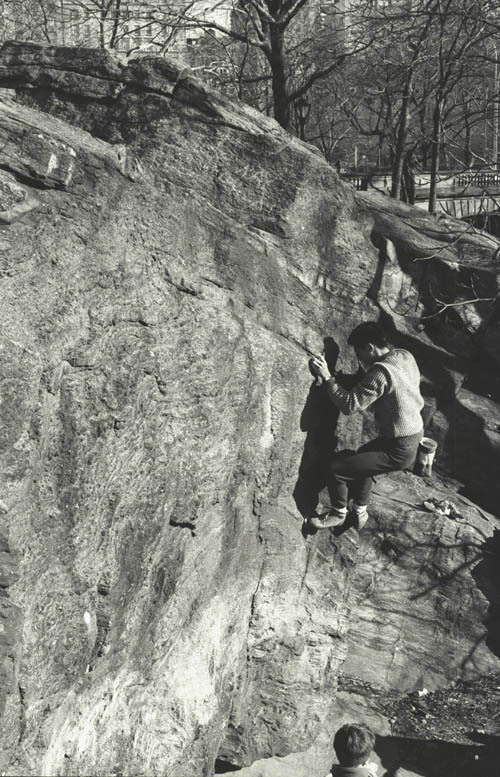 Private Angel V6 quickly proved to be the hardest and best boulder problem in New York City at the time. Soon after, Chris Gonzalez and Jeff Dahlgren began working on an even harder project that darted up the face between Private Angel and Scratching Post. Elias V9 was eventually put up in a cold winter day in February 1989. DeLataillade made a fast third ascent, but soon after a key hold broke near the start. The problem went unclimbed for several years until Komba finally managed to create an entirely new sequence to overcome both the broken hold and the very height-related crux. Following six months of intense focused effort, Komba climbed Elias utilizing 22 moves to get up 13 feet of rock. Since then, there have been no other known ascents. Start: On the slightly overhanging face just right of the obvious right-facing corner. Go: Up onto the low ledge and make a tenuous move to gain the top. Start: At the obvious right-facing corner on the east side of the boulder. Go: Up the awkward corner. Start: On either side of the obvious arete that creates the left side of Cat Corner. 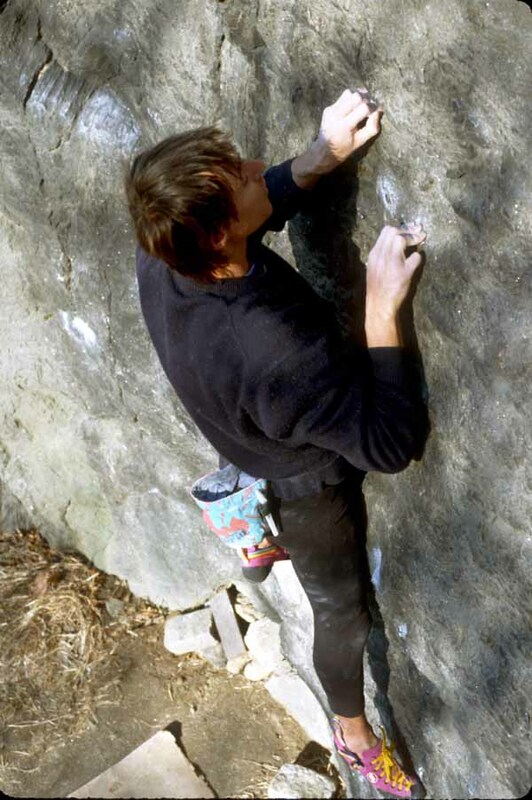 A classic boulder problem. One of the best in its grade. Despite being modest in height, it can feel intimidating, especially near the top. However, good holds are to be found for the exit moves. Start: Immediately left of the arete. The right hand crimps on a thin, sharp flake hold. The left hand on a small sloped hold. Go: Straight up. Gain the obvious foothold and make one hard move to grab the good hold above. Top out directly or move left to the groove and exit. 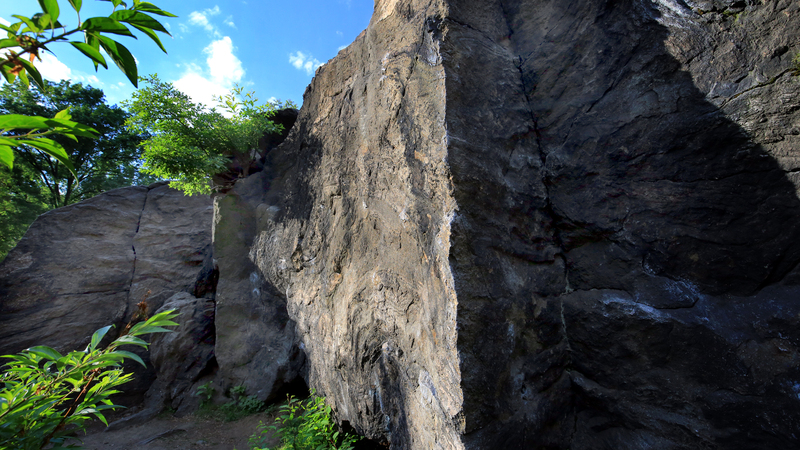 This problem was originally referred to as "Left of the Arete." At the time it was the only established problem on the main face.